I am of the firm belief that food binds religions together. I love that people of all faiths indulge in the food specialty of every religion, not to mention even take part in full fledged celebrations all around the world. I feel honored to have friends who come over to our house during Ganesh Chaturthi and help around the kitchen while making ukadiche modak for the deity's offering, or when all of us go together to a Gurudwara and do seva together. Me and my brother go around our apartment complex every year without fail, with a plate full of faraal (a variety of sweets and savoury snacks including laddu, karanji, chakli, barfi etc.) during Diwali to the doorsteps of all the families regardless of what their religion is. This year I missed out on visiting Mohammed Ali Road during the holy month of Ramadan. For those of you who don't know, Mohd. Ali Road is THE place to be during this month, with an overdose of food awesomeness along the streets ranging from Keema Pav, Kebabs, Offal masala, Biryanis, Baida Rotis, Ice Creams, Malpuas with luscious Rabdi, Gulab Jamun, Halwa Poori... The list goes on and on! Just because of the excellent offerings, this place has become the go-to destination for every foodie in Mumbai and off late a popular place for curated food walks as well. I must confess, I have never been to Mohd. Ali Road before. But every year, someone or the other brings lots of packed goodies home and at least I get to devour them. I have been so upset about completely missing out on all the yummy things, especially my favorite dessert - Phirni. Phirni is kind of a rice pudding which originally has its roots in the Middle East. You can find versions of this dish all over the region. 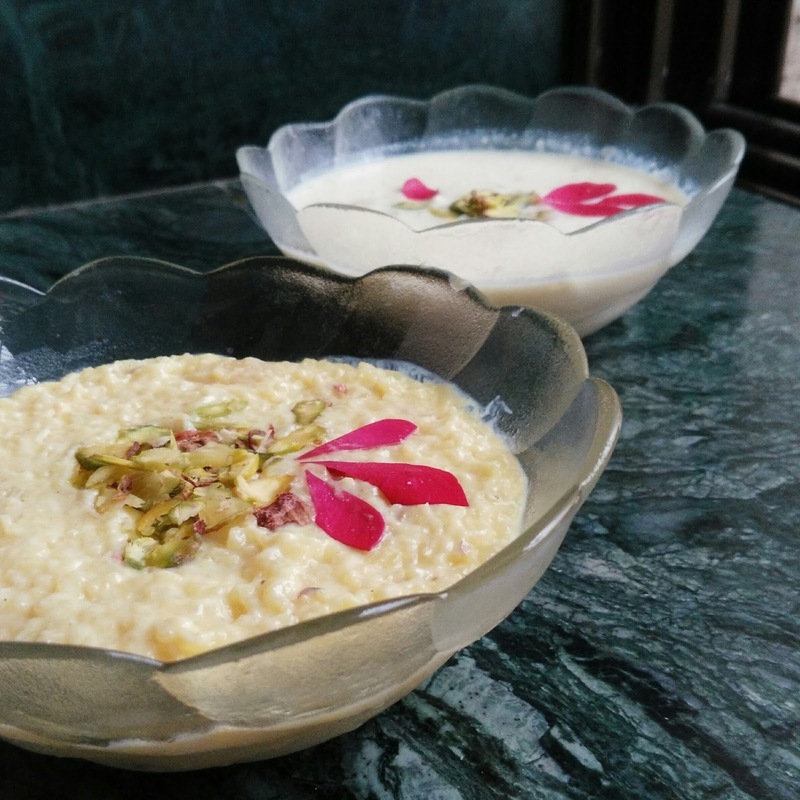 Here is a special tidbit: Whenever there is a special occasion at home I ask my mom to make Phirni for dessert and she always, always makes Kheer instead. When I argue with her, she tells me that it is the same thing. But it isn't. 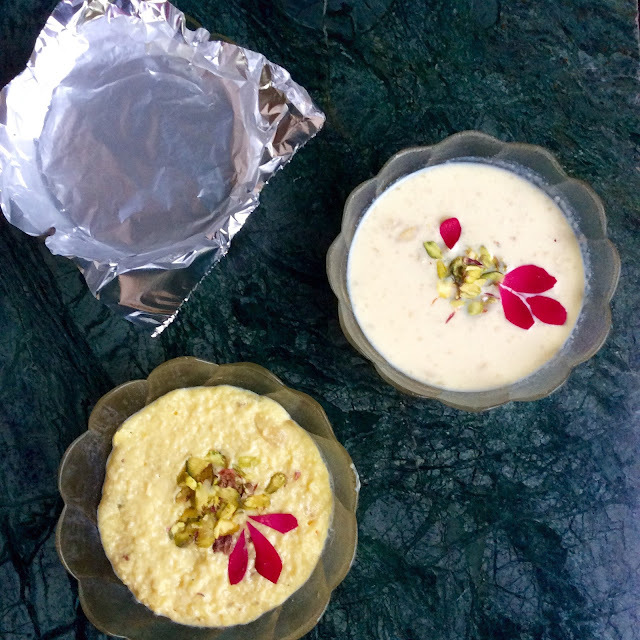 Kheer can be served warm or cold but the awesomeness that is Phirni, needs to be served chilled. Not just that, Phirni is made out of coarsely ground rice whereas Kheer can also be made out of whole rice. By now, I am sure you can already tell that I really have missed my dessert. Takes 40 minutes + Chilling time. Aluminium Foil, cut into squares that fit the circumference of the serving bowls. Heat the milk in a thick bottomed non stick pan till it comes up to the boil. While the milk is heating up, grind the rice in a spice grinder to a coarse powder, make sure it isn't too fine. 8-10 pulses do the trick for me. Reserve 2 tbsp milk when it reaches a decently warm temperature. Add the saffron strands in this milk and set aside for later. Place the Almonds in a microwave safe bowl and cover with water. Microwave for 90 seconds. Let them cool slightly and then peel them. Slice or chop as desired. Set aside for later. When the milk comes to a rolling boil, reduce the heat to low. Add in the ground rice and sugar. stir constantly so as to avoid any lumps. Note down the time at this point. Keep stirring occasionally. Do not cover your pan. Save some Almonds for garnish and add the rest to the Phirni and continue to cook till the rice is done and the desired consistence is reached. The Phirni should be set in the bowls upon chilling, but it is important to know that Phirni thickens as it cools, so a slightly pourable consistency works best. For the Classic Rose Phirni, turn off the heat and add in the Rose Water. Give it a good stir. Let the Phirni cool till it reaches room temperature. Transfer the Phirni to bowls and garnish with Pistachios and Almonds. I used Rose petals as well.